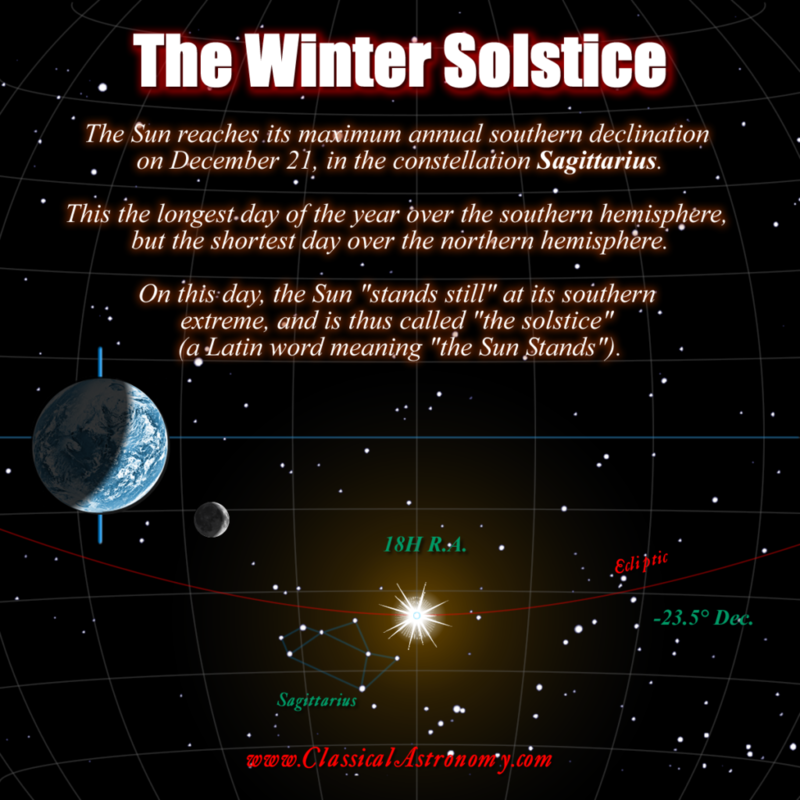 WINTER SOLSTICE: Winter begins for the northern hemisphere on December 21 at 22:23 UT (5:23 PM EST). This is the precise moment when the Sun reaches its most southerly declination of the year. For this reason, December 21 is the shortest day of the year. As seen from the northern hemisphere, the noon Sun is lowest in the sky of any date of the year. From latitude 40 degrees north (New York to San Francisco), the noon Sun is low, grazing the treetops, and the noon shadows are twice as long as the objects casting them. After this date, the Sun is higher in the noon sky each day, which causes the days to grow longer. In the southern hemisphere, the sky appears upside down and everything is reversed. The Sun is highest in the noon sky, thus making the days the longest of the year. December 21 is the summer solstice for the lands of the southern hemisphere (or so I am informed from Professor Richard Barker of the University of Otago in New Zealand). Celestially speaking, the Sun is lined up with the constellation Sagittarius on December 21, as seen from the Earth. In the coordinate system of the sky, the Sun is at a declination of -23.5 degrees, or 23-1/2 south. The Sun is at 18 hours right ascension, halfway around the celestial sphere from the place of the summer solstice in Gemini, the northern extreme of the zodiac. Since the Sun is high in the sky in Sagittarius at noon, Gemini (and its neighbor, Orion) is high in the sky at midnight.